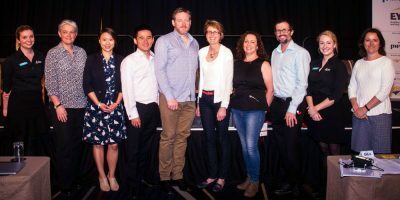 The 2017 Injury and Disability Schemes Seminar welcomed over 300 delegates to Sofitel Brisbane Central this week. 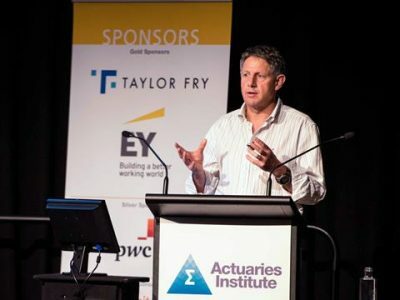 With over 50% of delegates being non-actuaries, there was a great diversity of thought and experience presented in four plenary and 48 concurrent sessions. Stephanie Quine reports. 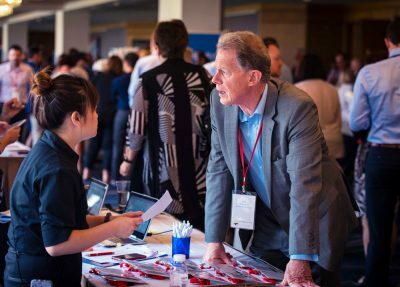 The Seminar’s highly anticipated Keynote Speaker, David Bowen, spoke candidly about successes and failures in his previous roles as the inaugural CEO of the National Disability Insurance Agency (NDIA) and consultant to Commonwealth Treasury and Department on the NDIS. 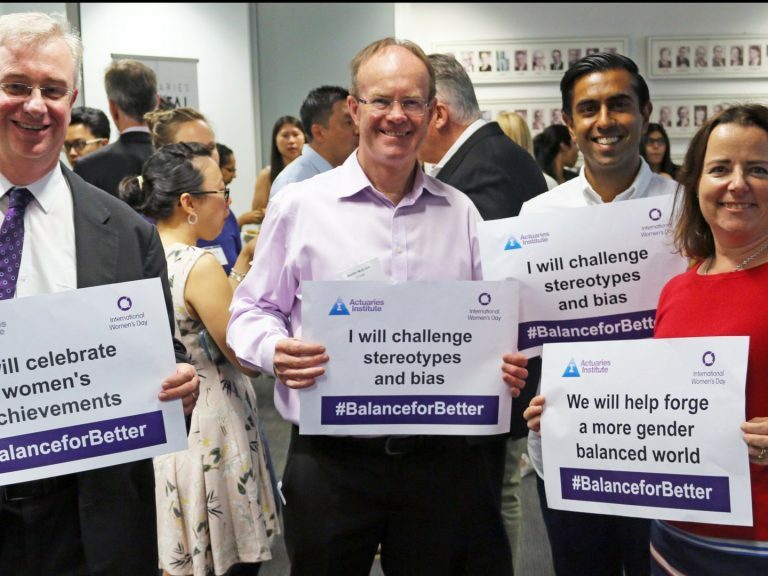 “I’ve been involved in three attempts to reform medical indemnity…it was incredibly disappointing and difficult,” said David, highlighting the critical issue of national consistency and the need to take account of health outcomes and rehabilitation. David described “an IT system the NDIA has never controlled”; incredible growth; and staff with too much pressure and high levels of discretion as some of the current “major problems” facing the NDIA. However, he also said the scheme inherited the legacy of broken state and federal funding systems. “For decades, there’ been a 20% shortfall of those who have been provided for in the system, and those who are actually there,” he said. 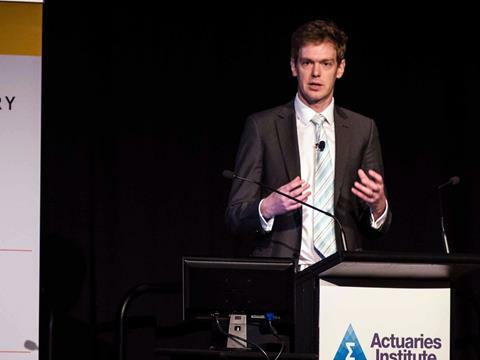 David also spoke about the opportunities of using and linking different data sets in government, and acknowledged the work of actuaries, including Taylor Fry’s social welfare work in NZ and Australia. 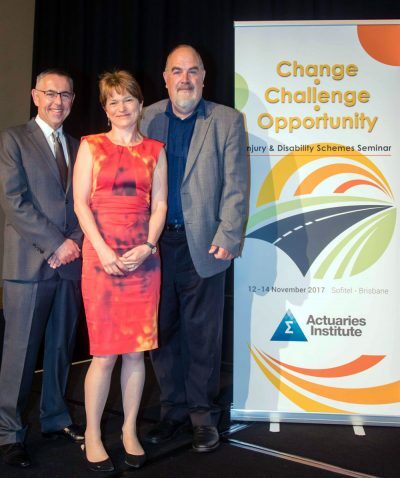 “Actuaries’ are involved in advice and strategic development. We have been able to recognise expectations and work harder to deliver,” he said. 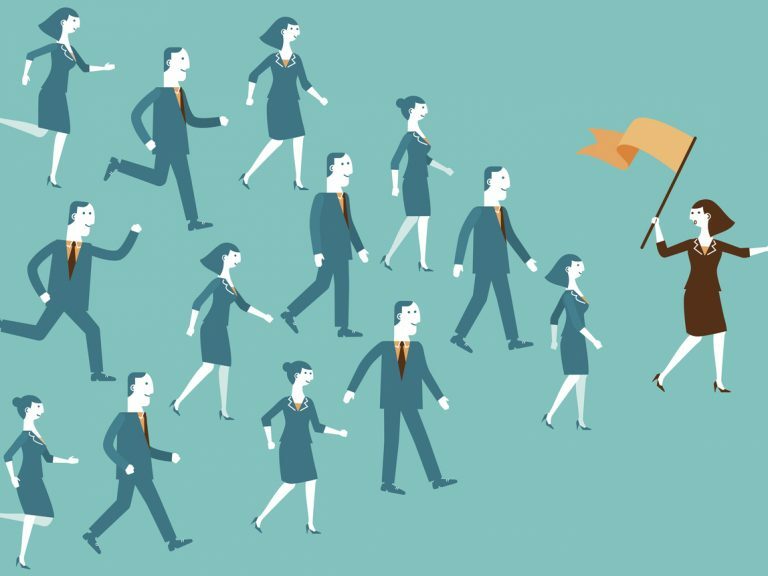 David acknowledged worldwide studies that show when you put the person in control of the funding, they manage better outcomes, at a lower cost. He also made a point on personal injury insurance matters, that “lawyers need to start taking a much wider social view…and of the best interests of their clients… in whether they pursue litigation or how they go about that litigation”. 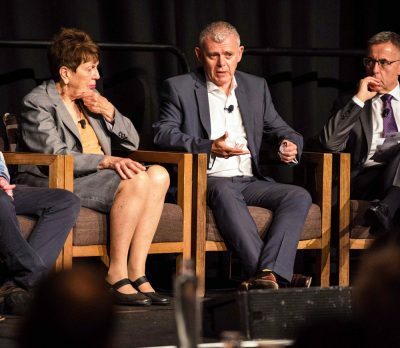 Carmel Donnelly (State Insurance Regulatory Authority), John Nagle (icare), Joe Calafiore (Transport Accident Commission) and Clare Amies (WorkSafe Victoria) all spoke about the common theme of trust and a client centric approach to claims management in this Plenary. John highlighted how icare is consulting with rehabilitation providers, industry groups, employers and injured workers to better understand what best practice for workplace rehabilitation looks like. “Despite the tens of millions of extra dollars paid out for rehabilitation services, our data analysis confirms the extra expenditure has not led to better return-to-work rates or outcomes”, John said. 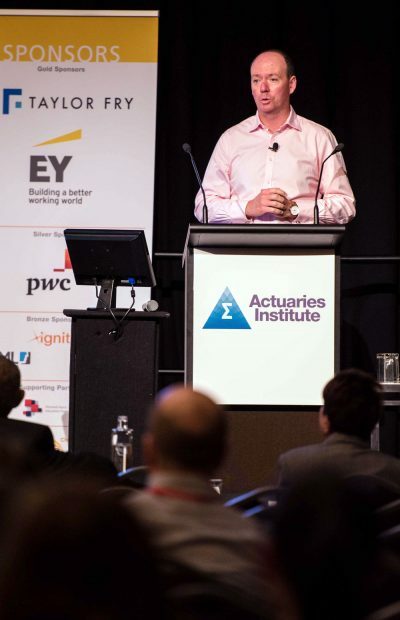 For more detail on icare’s work in this space, read John’s Opinion piece on Actuaries Digital. Claire outlined the ‘2030 strategy’ Work Safe Vicotria that requires what she called “a broad cultural shift that will embed a prevention-led ‘active’ approach. Carmel said there is “‘deeply disturbing evidence” that some people would be better off in terms of social outcomes without CTP cover, so we need “to stay at the table and together solve the problem” and “if we’re going to fund on outcomes, we’ve got to make sure we measure them really well”. Kim Birch (CTP Insurance Regulator South Australia) shared the SA journey to establishing the inaugural CTP insurer and the challenges they faced – everything from simply starting up an office space to collaborating with Australia Post on paper claims. 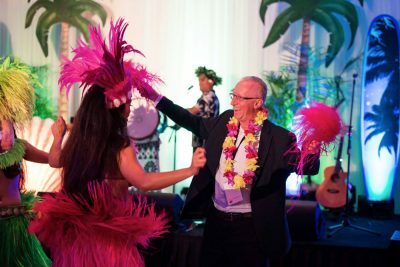 Mark Coyne (EML) outlined how EML is engaging in “motivational interaction” with customers – enhancing empathy and support. Delegates digested all the presentations over lunch continuing to discuss the challenges and opportunities of schemes – two plenaries weren’t enough! The speakers in this session: Julian Williams (Founder, Cordius and Former Partner, PwC), Eugene McGarrell (General Manager, Health and Community Engagement, icare), Pamela Rutledge (CEO, Flourish Australia) and Geoff Atkins (Director, Finity Consulting), who were interviewed before the event in this Actuaries Digital article, each gave a unique perspective on the complexities of this issue, and approaches to mental health within our schemes. “What matters is not the medical diagnosis, it’s the complexity that surrounds the person: housing, jobs, family etc. Insurers have to factor this in” said facilitator Norman Swan. His point was made clear by Julian Williams, former PwC partner, who shared his very personal lived experience (denial, loss of joy, effect on family relationships, time off work, catastrophising and suicidal thoughts) of a mental health battle. “The psychologist said, for the next month, focus on no one but yourself. 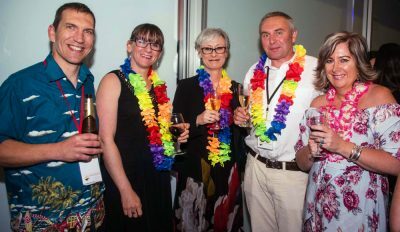 PwC was nowhere to be seen – that was magic… they gave me time to get better,” said Julian, raising the importance of co-workers and family asking R U OK? and for him, starting on medication. A powerful talk. Eugene then took the mic, highlighting how the ‘family community’ has somewhat been replaced by the ‘work community’ in today’s society, and the opportunity this presents to use workplace as a tool for recovery. He discussed the varying degrees of success of courses on mindfulness, CBT, and return to work (RTW) stress management, depending on the person, and how insurers need to be more ‘adaptive and collaborative’, beyond a purely evidenced based, technical approach. Pamela then discussed the use of ‘personal situation plans’ that detail what employer should do if a person becomes unwell or distressed. 52% of Flourish Australia’s employees identify with having a mental health issue and the organisation gives preference to recruiting those with such experience. The Plenary Q&A was thought-provoking, ultimately revealing that there is not one simple solution to this multi-faceted problem. In this final Plenary, Tim Clark (Chief Actuary, IAG), Dr Hugh Miller (Senior Actuary, Taylor Fry), and Dr Chris Colquhoun (Chief Medical Officer, icare) explored how technological changes, improved analytics capability and medical advancements can be harnessed to improve customer experience and drive better outcomes for injury and disability schemes. “A lot of machine learning is actually just chucking a whole lot of data together and seeing what patterns come up,” said Tim Clark, musing on reducing the complexity of the world into a model. Hugh followed with a reflection on the ‘power of prediction’ – perhaps not extending as far as geopolitics – but certainly in other areas, as Taylor Fry’s work in social welfare modelling has shown. 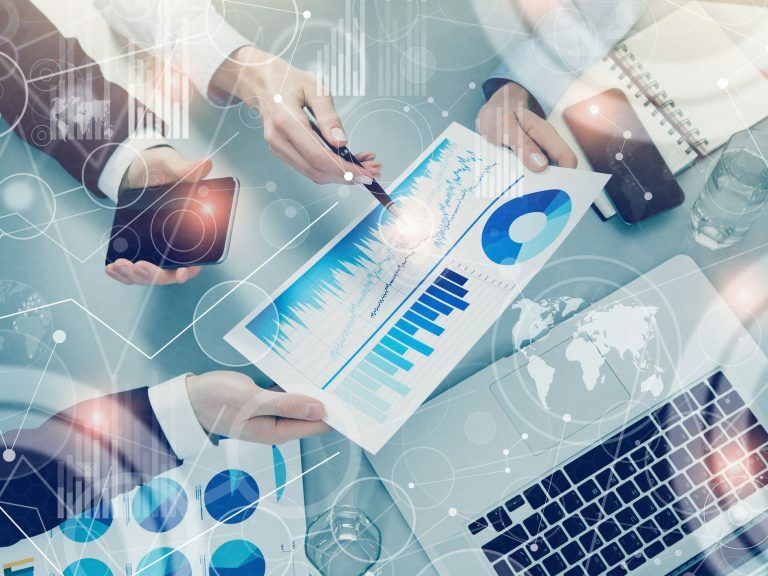 “Prediction has gotten better, and it will continue to get cheaper and easier to do,” said Hugh, adding that a business case for the technology was essential to complete the ‘tripod of innovation’. 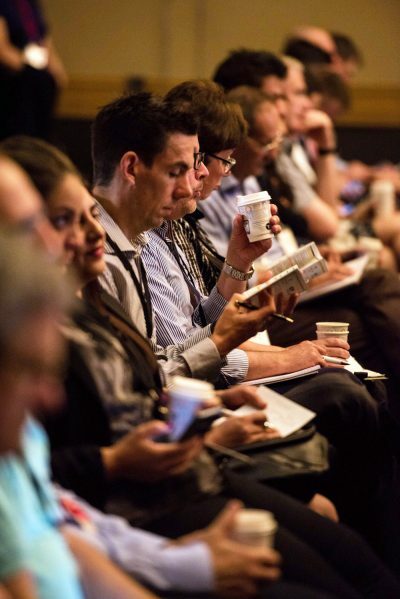 Dr Chris began by saying he was ‘blown away by the calibre of presenters’ at IDSS. His experience in medicine and as an Occupational and Environmental Physician provided a strong backdrop for his thoughts on the future of health care. 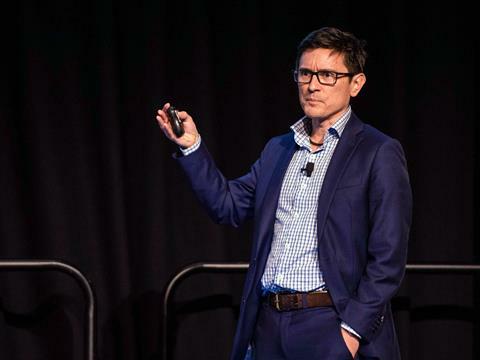 “It’s important to take healthcare practitioners on a transitional journey to delivering secure electronic data,” said Chris, adding that better transparency on practitioner performance and paying more for outcomes, rather than service, was the way forward. “I think the people will become at least a partner or the primary decision maker in the process of treatment,” he said about todays ’empowered’ customers. 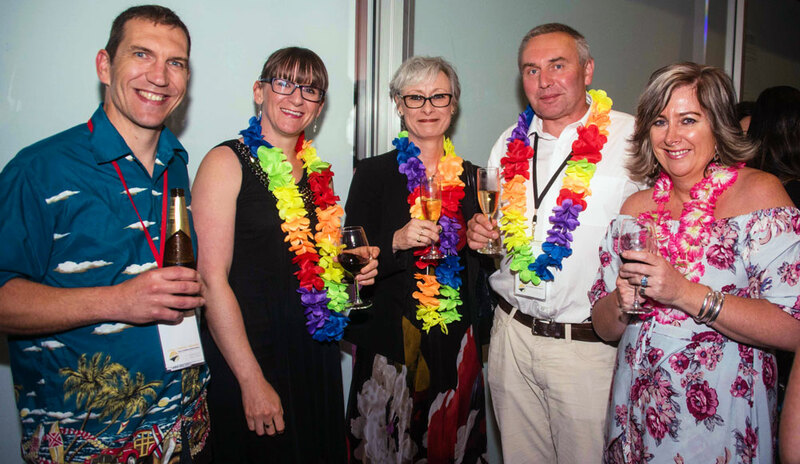 Following a thoughtful panel Q&A session, President, Jenny Lyon gave her closing remarks, acknowledging the hard work of the IDSS Organising Committee, HQ Events Team and all the plenary and concurrent speakers, who made the 2017 Seminar a success. Joshua Martin and Jefferson Gibbs’ session on Introduction to Mental Health was of high interest, especially in light of the Institute’s latest Green Paper Mental Health and Insurance. Co-author of the paper, Geoff Atkins discussed it in Plenary 3 and in this article. The theme continued with presentations from Steven McCullagh and Dr Simon Rosenbaum on innovative approaches to improving health and wellness outcomes for injured NSW police officers. Robert Aurbach delivered a presentation on his paper Fighting ‘Fight or Flight’ focused on ‘difficult’ claimants and how their actions are a natural autonomic nervous system reaction to perceived threats in the claims environment. There were also several sessions on CTP Scheme updates from QLD, NSW, ACT, WA and TAS, touching on benefit reform, workers compensation, scheme performance and motor insurance. We had a full house for David Gifford and Cassie Citroen’s session on ‘The next evolution of client risk identification and segmentation at the TAC’. Cassie provided an overview of the ‘TAC Longitudinal Client Outcome Study‘ and David explained that segmenting clients and identifying risk is important in getting clients’ lives back on track. “We need to keep our schemes sustainable – we need to be here for today’s clients and tomorrow’s clients,” said David. The final concurrent session of Day 1 included the highly anticipated NDIS Scheme update from Scheme Actuary, Sarah Johnson, as well as the ACT CTP Scheme Update. 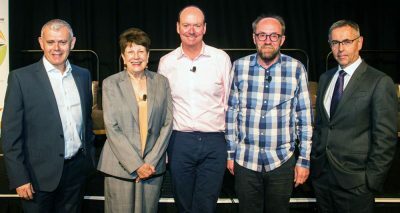 Dennis Woon, Graeme Adams and Claire White came together for a forward-thinking session on autonomous vehicles and how robots will change CTP, asking: what does the future of CTP look like in 2055? 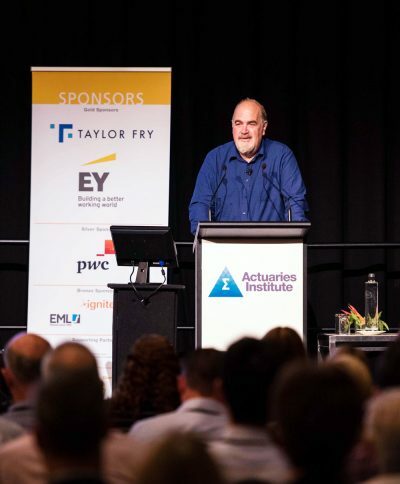 Author of Actuaries Digital’s Normal Deviance column, Hugh Miller, spoke about ‘Building Better PPAC Models’ and Lisa Simpson unpacked the The Future of Workers’ Compensation, asking: what will our future industries, and employees look like with the increasing casualisation and ageing of our workforce? Following a full day of insightful sessions, delegates changed into their best LUAU outfits before making their way to the Moda Events Portside for the IDSS Gala Dinner. 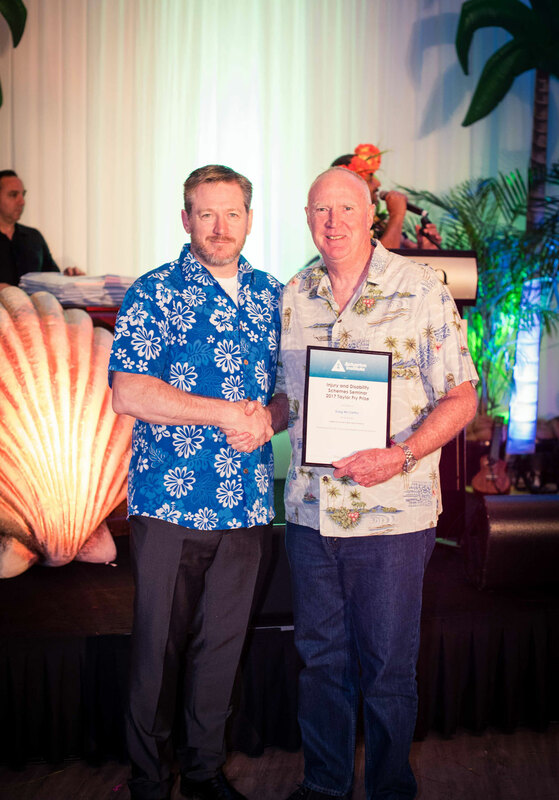 There was a colourful array of entertainment and celebrations continued as Greg McCarthy was awarded the Taylor Fry Prize for his paper ‘Insights for Success in Work Injury Insurance‘. The Seminar sponsored R U OK? as it’s chosen Charity this year. Many thanks to all our valued sponsors.